Oh I do like to be beside the sea side! When you're relaxing on the beach you want to be comfortable. Sitting on the sand isn't for everyone and if you fancy a snooze you can end up getting sand in your face and who wants that. 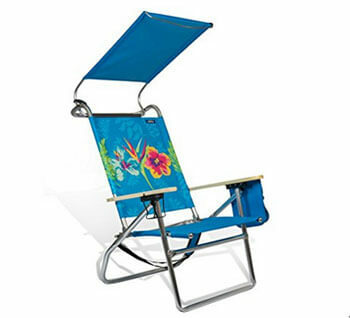 Finding the best beach chair can make your trip to the beach comfortable and relaxing. A beach chair can let you relax as well as offer storage options too. Once you get an awesome chair you will never settle for sitting on the sand again. Large feet so doesn't sink into sand. Beach chairs come in all sorts of shapes and sizes and have many different features. You can opt for the classic no frills chair or go for something with a little more comfort and convenience. A beach chair can come in handy as a camping chair too. A multipurpose chair is probably your best bang for buck. Here we take a look at some of the features you may like to consider when buying a beach chair. 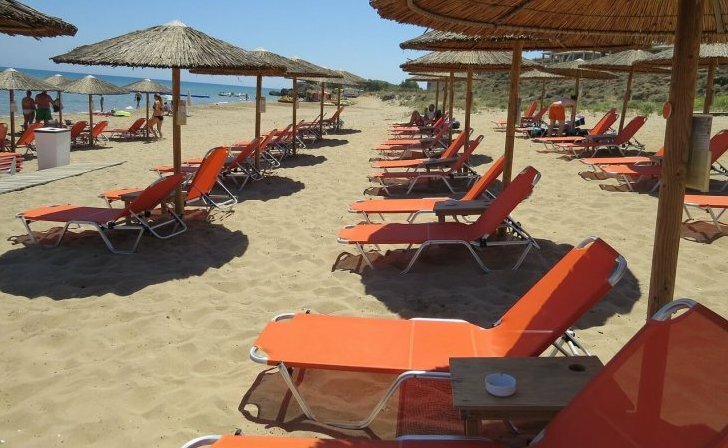 There are quite a few different types of beach chair to consider. The traditional lounge style chair can be found lining the beaches in some places and you can hire them to use. They are usually made from a wood construction and can be heavy. They do fold but they can be quite long in length. 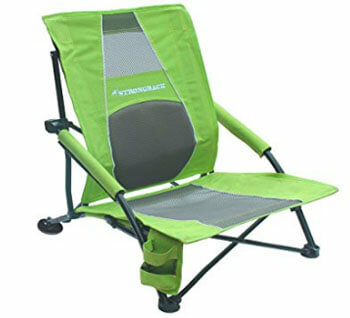 They are nor the best option for portability but there are designs based of the traditional lounge beach chair which give you a lighter frame and easier to store lounger. Chaise Lounge Chair is an example of a more modern lounger but they can also be quite heavy and more difficult to transport than other types of beach chair. Lounges are all about comfort though and some have some great features to provide even more comfort so you can relax. You may find that a lounge chair is totally worthy carting around or great when you can park very close to the beach. The classic sand chair is perfect for portability. It is small, compact and sturdy in the sand. If you have to travel far by foot to the beach or need to drag a chair around with you then the sand chair is the best option due to its smaller more manageable size. This style is a bag that has shoulder straps so you can cart it around like you could a backpack. These chairs are comfortable, lightweight and usually durable. These have long backs for extra support and are great for tall or large individuals. They are also used by older people too for the additional support. Despite the additional length you will need to carry, they still remain lightweight and easy to move. This style is designed to support the entire length of your body. They are usually constructed of lightweight materials and still remain relatively light overall. You can really take the weight off your feet on this one. Although not a chair as such, a beach hammock can be great alternative choice for lounging about on the beach. 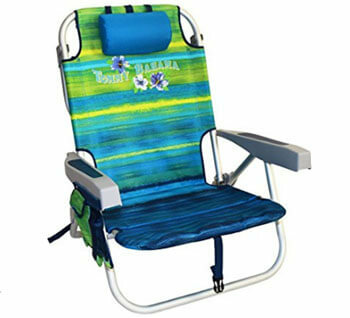 As mentioned the likelihood is that you are looking for a portable option when it comes to a beach chair. This is where the focus will be in this guide. When looking at the portability of a chair, you need to factor in the weight and what its dimensions are when collapsed. Some chairs can take up very little room and if you have a small car you will want to go for one of these options. Of course comfort is just as important as portability. You want to actually feel find sitting in the thing. Some models can be comfortable enough but there are others that have considered and worked on the comfort of their chairs. These will include ergonomic features and also have padding to create a good experience. The padding however is likely to make the chair more bulky to store, so this is something to factor in when deciding. It is always great when a chair comes with a carry bag, especially as you will most likely be juggling a ton of other things you want to take down to the beach. Recline Positions – Let’s not forget recline positions. Not all chairs have this feature but its always great to be able to put your chair in a position that is comfortable for you. A recline feature is a must! Cup Holders – A cup holder is a great feature and something that seems to be common place on camping and beach chairs. Make sure the cup holder can accommodate the type of cup you would want to put in it – some can be too small for personal cups and favour bottles instead. Storage – Some chairs come with storage for small things or for a towel. This can come in handy if you like to keep things organized. Umbrella – Another feature you might want to consider is a chair that comes with an umbrella attachment. There is no shade on the beach and its not good to have sun the blazing down on you the entire time you expect to be sitting on the beach. 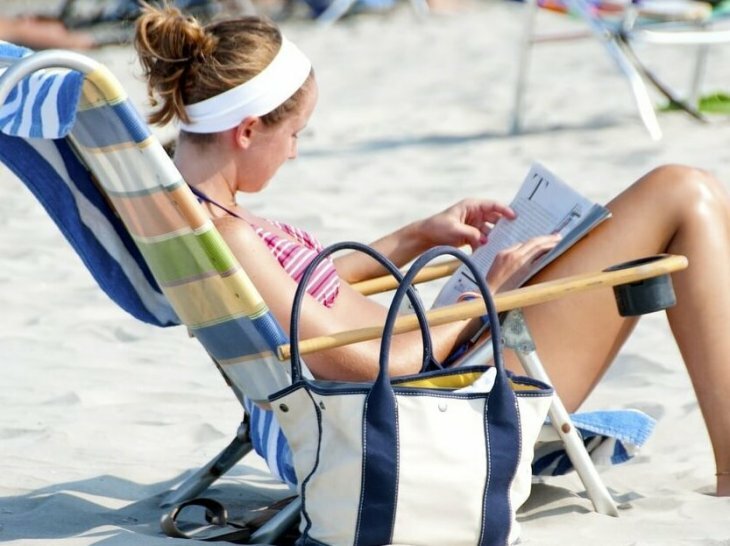 Headrest and Footrest – The beach is all about relaxing so a head and foot rest are great additional features to have for proper relaxation. Beach chairs can come in a variety of materials for the frame and the fabric used. Aliuminium is the most popular choice and most commonly found frame choice. Aluminium is lightweight yet durable making it a good choice. Of course, which the tradition style, you will find wooden frames too. The downside to wood is that it can be quite heavy but it is definitely durable. It also is better at absorbing heat, where as aluminium will get hot in the sun. Plastic is also common too but these are generally for cheaper chairs. Plastic is lightweight and easy to move about. Plastic is not as strong as aluminium or wood, so much less durable. It is a good choice for a child’s beach chair though as generally kids grow out of things very quickly and thus durability maybe not be on the highest priority. 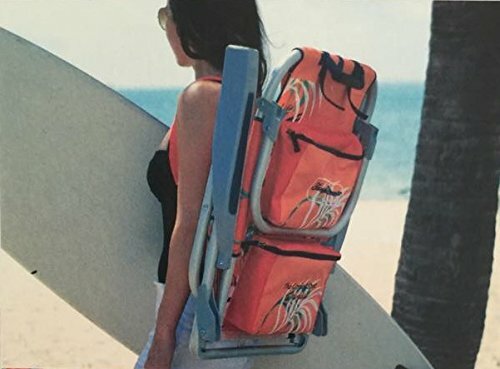 The Tommy Bahama backpack chair is the perfect companion for anyone going to the beach. It has all the features you could ever dream for! 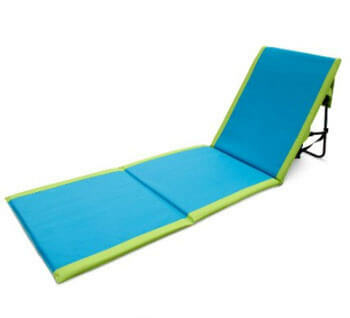 It is a small sand chair with the ability to recline flat, which is perfect if you fancy a snooze or a lay down. As well as lying flat, it also reclines to 5 positions (including the lay flat option). On the back of the chair are 2 large storage compartments and one is insulated so you can keep things cool. It also has an adjustable pillow for comfort, a cup holder and smart phone compartment. It also has a folding towel bar too to put your towel on! The frame is made from aluminium and has molded arms for comfort. The fabric is 600 denier fabric which is durable and comfortable. The backpack straps are also padded so it is comfortable to wear and cart about. CONS: This is quite an expensive chair and some people have had quality issues with it. 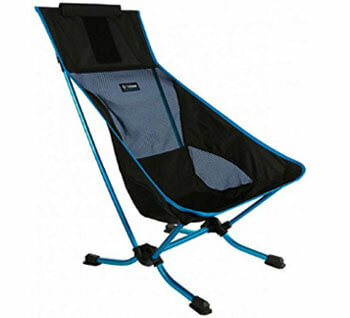 The Helinox beach chair is lightweight and sets up quickly. It is easy to use on the sand and has a single shock corded pole structure for sturdiness and durability. The chair is supportive for both your back and neck. The fabric is breathable and has mesh back and side panels for breathability. The storage sack also converts into a pillow so you can have additional comfort without taking up additional space in your car. CONS: Sits low so maybe difficult for some people to get in and out of. Expensive compared to other brands. The strongback low gravity chair has a patented lumbar supportive design which stands out from other chairs on the market. It’s back support helped align your posture and ease any tensions you may have. This is perfect for you if you struggle to sit comfortably without having back ache. It can hold up to 300lbs. The frame is made from silver coated steel and the fabric used is polyester. It also has extra large feet so it doesn’t sink into the sand and a cupholder too. The chair overall is lightweight and easy to travel with. It comes with a carry case that has double straps for comfort. PROS: Back support. Sitting in a chair can be highly uncomfortable and even painful for some people. The back support is a great feature many chairs lack. CONS: No useable armrests, getting up and down maybe difficult due to being low to the ground. The Copa Canopy beach chair offers 3 positions of reclining using the forearm rests and a canopy to shade yourself from the sun. The seat is also extra wide to accommodate those who need the extra room. It also has a storage pouch. This seat isn’t low to the ground either, so ideal for those who prefer to be a bit more off the ground. It comes with padded shoulders straps too for easy transportation. CONS: Canopy isn’t adjustable so not suitable for taller individuals. In the last couple of years inflatable loungers have become all the rage. They are easy to travel with and lightweight. They are made from polyester cloth and nylon fabric which feels soft and comfortable to lie on but also maintains durability. 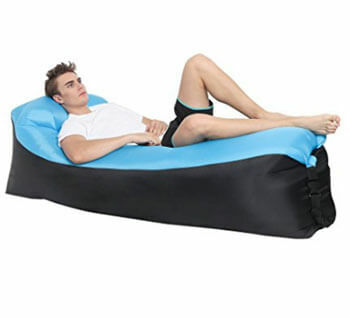 The inflatable lounger is also easy to fill with air. You don’t need a pump to transport around with you too. Instead you open itand run with it. Make sure you run against the wind. You only need to do this briefly and it will fill up. On the beach, the sea breeze should help make this easy to do. Alternatively, if at home, it is suggested you can use a fan to blow it up instead. Sounds easy! This particularly brand gives a lifetime warranty too, so this gives you ease of mind on its durability. PROS: Easy to transport, easy to set up. This is a simple padded lounger but don’t be put off by its simplicity. It is easily portable as it folds up and has backpack straps to easily put it on our pack. There is also a larger zipper pocket for personal items. The frame it made from steel and it is padded with foam. The backrest is adjustable so you can put it to the position that is ideal for you. PROS: Easy to set up, clean and travel with. CONS: May not be comfortable for everyone.